The inaugural Memphis Fashion Weekend started with a bang last night. Jack Robinson Gallery was packed with local styleites looking for the kind of high fashion show Memphis sees woefully little of. What's more, this event secures a strong place for fashion in Memphis' future — by benefiting ArtsMemphis and up-and-coming local fashion designers. In that spirit, the night began with the Spring line from Ellis Dixon, a Memphis native who now works out of New York City. Her line was dominated by crop tops, pretty neutrals, and feminine silks and shapes. Next up, Carol Peretz introduced a Spring line of cocktail and occasion dresses with sumptuous textures, feminine patterns, and bold colors. And finally, Philosophy's Spring collection wowed attendees with exquisite lace details, elegant draping, and an overall ethereal quality. 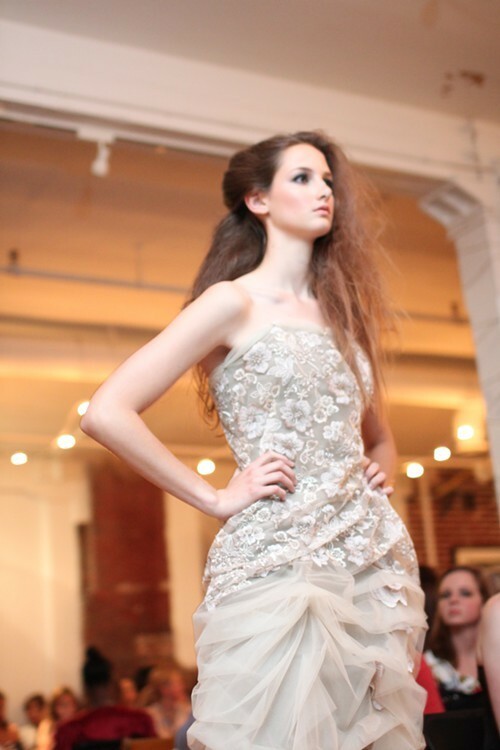 Tonight we'll be heading over to A. Schwab for the second and final evening of Memphis Fashion Weekend. Stay tuned for the next installment of Catwalking in Memphis!